PWTech Cyclone: Self-powered drum for treating storm water tank discharges, pumping station overflows, sewage treatment plant by-passes, and small CSOs. 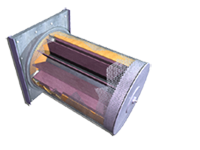 This patented self-powered drum screen is ideal for applications such as storm water tank discharges, pumping station overflows, sewage treatment plant by-passes, and small combined sewer overflows. The Cyclone achieves 100 percent removal of ¼-in. (6-mm) particles for two dimensions. Designed to be virtually maintenance free, the Cyclone has a projected 20-year life. Download the product flyer for more information on how the Cyclone operates. The cyclone is located at the spill point from the sewer system with the fixed internal weir at the minimum system discharge level. When fluid exceeds the level of the fixed internal weir, it flows through the screen, onto the internal vanes, and out of the discharge end. The flow of water onto the vanes, which are attached to the outside screen, causes rotation of the vanes and screen. The rotation of the screen creates a sheer force that continuously cleanses the screen surface. As flow increases, the additional fluid flowing over the weir and onto the vanes increases the rotation velocity, increasing the sheer and cleansing action. Manufactured from 316L or 304L stainless steel, then electro-polished, the Cyclone bolts directly to a chamber wall over a circular outlet, or spans across the CSO chamber from weir wall to chamber wall. The shaft bearings are also stainless steel and are sealed for life. The standard drum unit is 28 in. (710 mm) long with a 20-in. (500-mm) diameter. Whether installed individually or in multiples, the Cyclone can be designed with quick-release fittings and frames for easy removal and access to the CSO chamber. Three standard sizes with design flows of 1.77 cfs (1.14 mgd), 3.53 cfs (2.28 mgd), and 5.30 cfs (3.43 mgd).